My friend Rich Mead, head chef and owner of Sage in Newport Beach, CA, knows that two of the things I love in life are photography and food/cooking. He asks me to photograph (and I offer to help prep or cook if needed) the Outstanding in the Field dinner at an urban farm in Long Beach, and I can't accept the offer fast enough. Rich is the guest chef for the event, flanked by select staff members from his restaurant, and cooking all of the locally sourced ingredients (lobster, lamb, oysters, fish, vegetables) over coals on large open pit grills. After a quick and heavy late afternoon thunderstorm, the sky clears completely like a deep blue table cloth laid out for a meal. The smell of wet earth and hay at the farm mixes with the freshly scrubbed air, warm sun, and expansive sky. On this day with this weather, there simply is not a better place to be than a farm. Looking around and taking it all in with a deep breath, I realize that, at least as far as I'm concerned, it's Farm Day dammit. Not to mention the mouthwatering smells from the outdoor kitchen area beginning to poke at my hunger as the delicate yet massive dinner party draws near. Hats off to the Outstanding in the Field crew who kept everything on schedule and comfortably executed, set up the tables, chairs, and place settings, and shuttled the food from the outdoor kitchen to the guests. The servers sealed each delivery with a brief description about the fresh local ingredients and the techniques used to prepare the dish, plus answering any questions that come up. Very finely run by a group interested in what they do. Check out the website: http://www.oustandinginthefield.com for more. 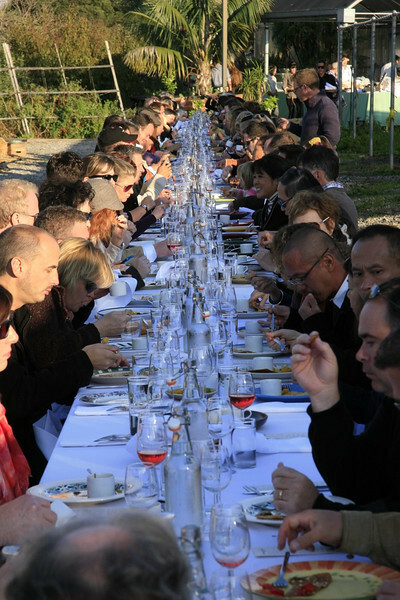 Over the next four three hours, 105 diners enjoy the meal at sunset, tour the farm, and have the opportunity to speak to the growers and farmers of all the ingredients. Since Rich and his team have the food well under control and I'm not needed for prep or cooking (Ok...I helped once by adding a few drops of cranberry syrup to one dessert dish), I take hundreds of shots on digital and film. Rich likes some of the shots from the dinner so much he wants to re-decorate Sage with large format prints. We're working on that now. Thanks Rich!